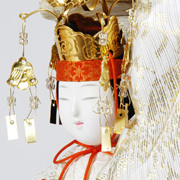 Hagoromo (meaning "wing robe" in Japanese) is named after a Noh play. The story is;This woman is an angel. 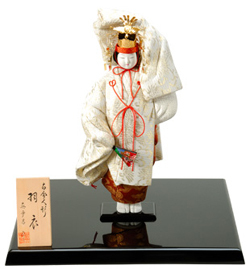 Her Hagoromo is stolen by a man, and she dances for him in order to get the Hagoromo back. 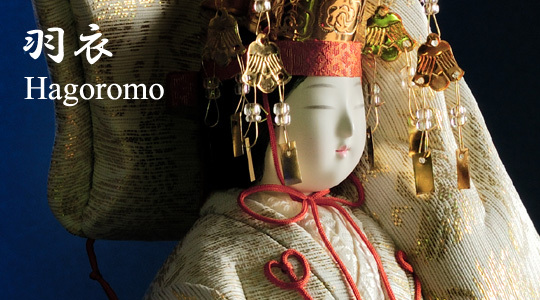 The man is fascinated by her and gives the Hagoromo back to her. Then, she goes back to heaven. 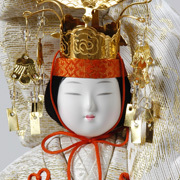 Hagoromo doll has 35cm height. 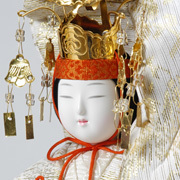 She has a fan and wears a crown, Koshimaki (waistcloth) and Choken (kind of kimono). No one can reproduce such a beautiful doll, but Mataro.